How many times have you seen an elegant cruise ship in a harbor or at the dock and taken a photo of it? Here are some pictures of miscellaneous cruise ships of all shapes and sizes. I think it is always fun to look at ships and wonder what they look like inside, where they are going, or where they have been, don't you? Some of these cruise ships I have sailed on at different times than when these cruise ship pictures were made, but it was great to see them again! The Celebrity Eclipse leaves the shipyard for the first time on February 28, 2010. 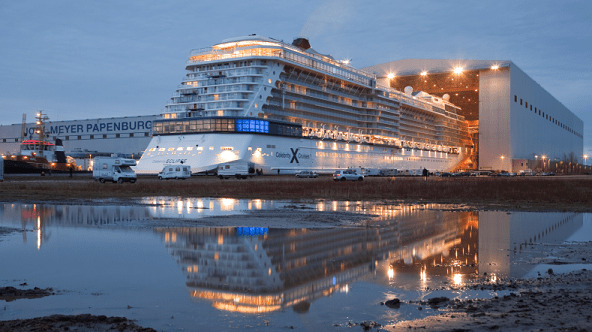 The public had their first glimpse of the Celebrity Eclipse as she emerged from the Meyer Werft shipyard in Papenburg, Germany. The ship entered service in April 26, 2010. Continue to 2 of 96 below. The Nieuw Amsterdam floats out of the shipyard for the first time. Continue to 3 of 96 below. The Holland America Line ms Nieuw Amsterdam floats out of the shipyard for the first time. Continue to 4 of 96 below. Passengers on the 552 berth Franca C enjoyed sleek, elegant interiors designed by Nino Zoncada. Accommodations, all in one class, featured bathrooms and air conditioning, heralding a new era of pleasure cruises. Continue to 5 of 96 below. My husband Ronnie was fishing in Mobile and took this photo of the Carnival Fantasy at the shipyard. See below the photo for information on the upgrade. The 70,000-ton Carnival Fantasy's extensive renovation in the fall of 2008 is part of the line's $250 million refurbishment program for its eight Fantasy-class vessels. The "extreme makeover" will include a new Carnival WaterWorks aqua park that will feature a 300-foot-long corkscrew water slide, dual-lane 82-foot-long racing slides and various water spray apparatus. Also featured will be Serenity, an exclusive adults-only retreat featuring plush chaise lounges and chairs, oversized umbrellas, teak decking and two whirlpools, while the "resort-style" main pool will incorporate a tropical theme with thatched roofs, faux palm trees, colorful umbrellas, and a tiled "beach" bordering the pool. Carnival Fantasy also offers 12 themed lounges and bars, a nine-hole miniature golf course, a 12,000-square-foot Spa Carnival facility, three restaurants, full casino gambling, a comprehensive golf program where guests can play top Caribbean courses, and organized programs for children in three different age groups – "Camp Carnival" for youngsters, "Circle C" for 12- to 14-year olds, and "Club O2" for older teens. Carnival Fantasy also offers a variety of staterooms and suites, all of which feature the "Carnival Comfort Bed" sleep system with plush mattresses, luxurious duvets and high quality linens and pillows. Ship-wide Wi-Fi access and cell phone service are also available. Continue to 6 of 96 below. Celebrity welcomed its newest ship on November 3 as the Celebrity Solstice arrived in South Florida, having crossed the Atlantic from the Meyer Werft shipyard. Celebrity Solstice was named in formal ceremonies on November 14, 2008 and entered service November 23, 2008. Continue to 7 of 96 below. The Charolotte Amalie harbor on St. Thomas in the U.S. Virgin Islands almost always includes one or more cruise ships such as the Holland America Eurodam. Continue to 8 of 96 below. Paul and his wife Dee sent in this photo and an excellent review of their Mediterranean cruise on the Carnival Freedom. Continue to 9 of 96 below. Numerous cruise ships are often in port in Juneau during the busy summer cruise season. The small ships Spirit of Yorktown, Spirit of Discovery, and Lindblad Sea Lion were also in Juneau on the day we docked on the Regent Seven Seas' Seven Seas Mariner. Juneau has as many as eight ships visiting on any one day! Continue to 10 of 96 below. Continue to 11 of 96 below. Continue to 12 of 96 below. Continue to 13 of 96 below. Continue to 14 of 96 below. Continue to 15 of 96 below. Continue to 16 of 96 below. Continue to 17 of 96 below. Continue to 18 of 96 below. Continue to 19 of 96 below. The Crown Princess was named in New York City on June 14, 2006. She will sail the Caribbean. Continue to 20 of 96 below. This picture of the Crown Princess was taken during sea trials prior to her christening in New York City. Continue to 21 of 96 below. The Crown Princess cruise ship arrives in New York City for the first time. Like many ships before her, she sails past the Statue of Liberty into New York. Continue to 22 of 96 below. If you look closely, you can see a McDonald's restaurant flag with golden arches flying on a mast near the front of the ship. Continue to 23 of 96 below. The Celebrity Century sails away from Copenhagen on her way to more northern Europe ports of call. Continue to 24 of 96 below. Continue to 25 of 96 below. Continue to 26 of 96 below. Continue to 27 of 96 below. Continue to 28 of 96 below. Continue to 29 of 96 below. Continue to 30 of 96 below. Continue to 31 of 96 below. The Queen Mary 2 is one of the great ocean liners of the Cunard Line. Continue to 32 of 96 below. Continue to 33 of 96 below. Continue to 34 of 96 below. Continue to 35 of 96 below. Continue to 36 of 96 below. MSC Cruises' the MSC Monterey is now retired. This photo was taken in 2005. It's always nice to see old ships. Continue to 37 of 96 below. Continue to 38 of 96 below. Continue to 39 of 96 below. Continue to 40 of 96 below. Continue to 41 of 96 below. Continue to 42 of 96 below. Continue to 43 of 96 below. Continue to 44 of 96 below. On January 10, 2007, Cunard's Queen Mary 2 and Queen Elizabeth 2 set sail on simultaneous World Cruises from Ft. Lauderdale. Hundreds of spectators turned out to view the ships' ceremonial "Royal Rendezvous" just offshore. Queen Mary 2 embarked on her first-ever World Cruise - an 80-day circumnavigation of the globe - while Queen Elizabeth 2 began her "Silver Jubilee World Cruise" - an exotic 108-day voyage marking her 25th around the world. Continue to 45 of 96 below. Continue to 46 of 96 below. This picture of the Golden Princess was taken from the Celebrity Cruises' Infinity as we sailed from Buenos Aires. Continue to 47 of 96 below. Continue to 48 of 96 below. Some cruise ships like the Infinity spend their summer months in northern climates such as Alaska. Continue to 49 of 96 below. Cunard's Queen Mary 2 sails through Victoria Harbor in Hong Kong en route to Singapore as part of her 80-day maiden world voyage. Continue to 50 of 96 below. Continue to 51 of 96 below. The docking facility at Grand Turk Island is relatively new, but cruise ships are quickly taking advantage of it. This picture of the Holland America Westerdam and the Costa Magica was submitted by Barbara Crews. I wonder if Barb "collected" anything new while cruising the Caribbean? Continue to 52 of 96 below. This picture may look like these two cruise ships are VERY close together, but they are separated by the pier at Grand Turk Island in the Bahamas. Barb Crews took this photo of the Costa Magica balcony that was being used as a clothes dryer while it was moored next to her ship the Holland America Westerdam. I'll have to admit that I've been guilty of the same offense, but 99 percent of the time, no one sees your balcony this close! Continue to 53 of 96 below. The gleaming Emerald Princess shines in the sunshine as she prepares for her inaugural cruise. See linkbox below the photo for more information and pictures. Continue to 54 of 96 below. We were sailing at dusk along the coast of Brazil on the Celebrity Infinity when I glanced out the balcony door and saw the Deutschland in the distance. Continue to 55 of 96 below. Continue to 56 of 96 below. Continue to 57 of 96 below. Continue to 58 of 96 below. As we sailed into Rio de Janeiro in the early morning on the Celebrity Infinity, we noticed that the Costa Fortuna was also arriving at the same time. Isn't the ship lovely in the early morning sunshine? Continue to 59 of 96 below. Continue to 60 of 96 below. Continue to 61 of 96 below. Continue to 62 of 96 below. Continue to 63 of 96 below. Continue to 64 of 96 below. Like migratory birds, some cruise ships travel long distances. It is a long way from South America to Alaska. Continue to 65 of 96 below. Continue to 66 of 96 below. Continue to 67 of 96 below. Continue to 68 of 96 below. Continue to 69 of 96 below. These four large ships (two Princess and two Holland America) were in port in Juneau. Sometimes the capital of Alaska has up to eight ships in port. Continue to 70 of 96 below. Continue to 71 of 96 below. Continue to 72 of 96 below. The first section of the new Costa Magica cruise ship is delivered to the shipyard in Genoa, Italy. The first section of the Costa Pacifica, which entered service in Spring 2009, was delivered to Fincantieri shipyard in Genoa Sestri Ponente on August 6, 2007. The bow section of the Costa Pacifica is 127 meters long, nearly 30 meters high, and weighs approximately 8,000 tons. It was built in Fincantieri's Palermo shipyard and transferred by sea to the Genoa Sestri Ponente shipyard where construction will continue. The Costa Pacifica (114,500 tons and 3,780 passengers) is a sister ship to the Costa Serena. The Costa Pacifica will offer the same exciting innovations as her sister ships, including the Samsara Spa -- one of the largest spas at sea, two swimming pools with retractable magrodomes, and an authentic Grand Prix race car driving simulator. Continue to 73 of 96 below. Costa has three new ships on order or under construction in Italy with Fincantieri. In addition to the Costa Pacifica, two other ships, the Costa Luminosa (92,700 tons and 2,828 passengers) and her sister ship will be delivered by the Marghera shipyard in the Spring of 2009 and March 2010, respectively. At the end of 2010, when the last of the three ships currently on order are delivered, Costa's fleet will be 15 vessels strong and will offer more than 30,000 lower berths. Continue to 74 of 96 below. ​ Ushuaia, Argentina is a popular South America port of call and is often used as an embarkation point for ships such as the Hanseatic on their way to Antarctica. Continue to 75 of 96 below. Continue to 76 of 96 below. Continue to 77 of 96 below. Continue to 78 of 96 below. Continue to 79 of 96 below. Fireworks celebrate the rendezvous of Cunard's three ships -- the Queen Mary 2, Queen Elizabeth 2, and Queen Victoria -- in New York City on January 13, 2008. Continue to 80 of 96 below. Fireworks light up the sky in New York to celebrate the rendezvous of the three Cunard ocean liners as they sail past the Statue of Liberty. Continue to 81 of 96 below. The Queen Victoria and the Queen Elizabeth 2 ocean liners rendezvous in Fort Lauderdale in January 2008. Both ships were on world cruises. Queen Victoria, the newest ocean liner in Cunard's fleet, made her maiden call to Ft. Lauderdale on January 16, just three days after embarking on her Maiden World Cruise and making an historic Royal Rendezvous in New York with both sister-ships Queen Mary 2 and QE2. Queen Victoria has been sailing with QE2 since departing Southampton, England on January 6 making a tandem Transatlantic Crossing together. Queen Victoria was launched on December 10, 2007 by HRH The Duchess of Cornwall (Camilla Parker Bowles). Joining Queen Victoria at Port Everglades was Cunard's QE2, the world's most famous ocean liner. QE2 embarked on her 26th and final World Cruise and will complete her service to the Cunard fleet in November 2008. Continue to 82 of 96 below. Continue to 83 of 96 below. Continue to 84 of 96 below. Continue to 85 of 96 below. Continue to 86 of 96 below. American Safari Cruises' 36-passenger Safari Explorer has 18 cabins, four of which will accommodate families of three. The small ship also has one single cabin. Continue to 87 of 96 below. Marie took this great photo of the Emerald Princess while on a Halloween cruise to the southern Caribbean. Continue to 88 of 96 below. Continue to 89 of 96 below. Costa Cruises commissioned Italian sculptor Fernando Botero to produce this marvelous piece for the atrium of the Costa Luminosa cruise ship. The bronze sculpture "Reclining Woman 2004" depicts a female figure staring into space, daydreaming in a reclining position with a subtle and ironic expression and with her legs in a dynamic position of movement. The sculpture, which is 346 cm in length, 177 cm in breadth, 152 cm in height and 910 kg in weight, boasts an imposing presence which defines and influences the surrounding space, establishing an ongoing dialog with the decoration in the atrium of the Costa Luminosa. The lone individual is the subject of many of the artist's works, which often feature single female figures in striking poses, with expressions and attire that Botero uses to telling effect in order to convey personality, experience, thought and desire. Continue to 90 of 96 below. m/s Alta is a 16-passenger sailing ship. Continue to 91 of 96 below. Continue to 92 of 96 below. Lammer Law and her sister ship the Cuan Law are the largest trimarans in the world. At 93 by 42 feet wide, her size, tri-hull design, and shallow draft offers stability as well as space and comfort for naturalist cruises, but specializes in and is completely equipped for diving cruises. Attractive and functional, it is perfect for the dedicated diver and for those passengers wishing to have a close experience with nature. The artful combination of stability, grace, and speed make this yacht a perfect partner for a Galapagos adventure. The Lammer Law accommodates 16 guests in 8 cabins plus 8 crew members and 1 naturalist guide or dive master for a very personal cruising experience. With 1 crew member for every 2 guests, personal attention onboard the Lammer Law is exceptional in its class. The yacht offers a large, comfortable main salon with a library, bar, TV/video system and stereo; a sun deck; and a dining room for exquisite buffet dining. All cabins include double or twin beds, private facilities, climate controls, safe-boxes, and ample space to hang and store clothing. The furnishings and fittings are designed by the decorator responsible for one of Donald Trump’s hotels for a class and style which other small ships in Galapagos often lack. Divers will appreciate that the Lammer Law is completely outfitted for diving in the beautiful Galapagos Islands. Nitrox is available for certified Nitrox divers. Snorkeling gear and wetsuits are also available onboard. Continue to 93 of 96 below. Continue to 94 of 96 below. Continue to 95 of 96 below. Continue to 96 of 96 below.